Landmark in the landscape and history of the town, the bell tower of the former Saint-Jacques Cathedral was integrated in the Judith-Jasmin Pavilion (UQAM) in 1975. Could this famous vestige take a greater place in Montreal's imagination and urban space? This third talk concretely allows discussion on the future of this iconic tower, its symbolic potential and development tracks. Guests will have the opportunity to stimulate new ideas to radiate this icon at the height of its value and potential . This conference-talk is the last of a serie of three. 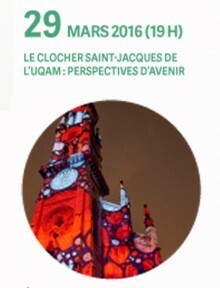 It will be held at la Salle des Boiseries du pavillon Judith-Jasmin de l’Université du Québec à Montréal.